Last year saw the appearance of a volume of essays written jointly by myself and my colleague Damien Broderick, both of us wearing our twin-lobed hats of science fiction author and science fiction critic. The volume, titled Science Fiction: The 101 Best Novels 1985-2010, compiled our candidates for the outstanding long SF works of the past twenty-five years. (We cheated numerically by including not only stand-alone books but a few series as well.) Although items were not ranked, nor trends necessarily elucidated in any systematic manner — each essay treating its subject in a self-contained manner — we did feel that by the end of the book we had charted a kind of map of the field’s development over a rich and tumultuous era, during which science fiction reached new heights of sophistication. We listed the books chronologically by year of publication, and that lagniappe 101st slot was filled by Hannu Rajaniemi’s first novel from 2010, The Quantum Thief. The coincidence of this novel’s arrival with the closure of our study’s era, allowing us to use it as a capstone, seemed wonderfully portentous and fated, since Rajaniemi’s book exemplified all the state-of-the-art techniques of the field, as well as deploying a boatload of hot posthuman, postmodern tropes while still honoring so many classics of imaginative literature. Plus, it was a rollicking adventure. Moreover, the author’s particulars — Rajaniemi is young, Finnish by birth, trained in math and science, living in the U.K., and writing in English — seemed to point to a youthful, global, multicultural extension of science fiction. 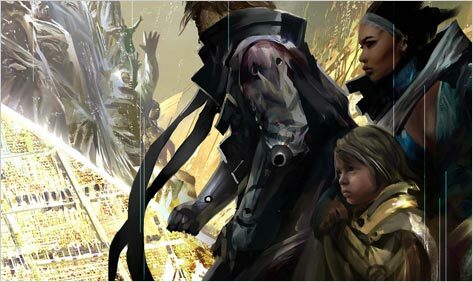 Of the book, we said, in part, “This extravagant, densely loaded, intricately playful, high-energy novel is the equivalent, for the end of the first decade of the twenty-first century, of Gibson’s Neuromancer when it launched cyberpunk.” Our praise has since seemed fully justified by the book’s continuing hearty reception. Now arrives the sequel, second in a projected trilogy, and The Fractal Prince finds Rajaniemi utterly living up to his startling first flash of conceptual and stylistic brilliance. The book begins with a frame-tale of sorts. A fellow named Matjek Chen — introduced to us late in The Quantum Thief and described here as “the great monster Lord of the [solar] system” — is navigating through a non-physical mental space that — irony of ironies in this digitally, quantumly, neurally transubstantiated future — takes the sensory form of a dusty antique bookshop. Suddenly, in a metaphorically arresting scene, a hand reaches up impossibly out of a book and pulls Matjek into yet another plane of existence, where he conducts a conversation with our hero, Jean le Flambeur. That roguish criminal, recently freed from a high-tech prison but shorn of many of his essential memories, handily recaps the events of the prior installment and then embarks on the main narrative: what happened after Jean and his ally/captor Mieli, a warrior woman from the Oort Cloud, left Mars. Jean has been resident in space on Mieli’s sentient ship Perhonen, preoccupied with opening a mysterious type of memory box, or consciousness prison, similar to the trap he himself once inhabited. But before long, Perhonen is captured at the same time Jean embarks on a dangerous maneuver, and Mieli is forced to make some drastic revisions to her plans. Parallel to Jean’s story is the tale of a woman named Tawaddud Gomelez, who dwells on Earth in the Shard, “a cylinder segment almost two kilometers high, a piece of the orbital O’Neill colony where her ancestors lived, until it fell from the heavens.” Earth — a venue not visited in Thief — is a dwindled backwater rife with killer nanites, kept at bay only by a kind of techno-magic employed by the dominant culture that recalls aspects of an Arabian Nights milieu: jinns, Seals, Secret Names, etc. But with the arrival of an emissary from a higher off-world sphere, the last city on the planet, is about to be overturned. Add the arrival of Jean and Mieli and Perhonen, and a rough-and-tumble fracas is assured. Now, this brief account, while accurate so far as it goes, fails in distinguishing Rajaniemi’s creation from most other postmodern space operas, such as those from Iain Banks, Peter Hamilton, Alastair Reynolds, John Wright, Vernor Vinge, and others. But there is indeed a difference, locating Rajaniemi closer to the works of the metaphysically challenging Greg Egan and the cyberpunkishly dense Charles Stross. The difference is twofold. First comes the sheer ideational complexity and density. Second comes the amount of parsing required for the reader to decode the story, a deliberately estranging and challenging feature of all the best science fiction, but one that Rajaniemi makes a specialty of the house. The intellectual complexity of the book is readily apparent — there’s about one new idea every paragraph or so in these books, or at the very least a new twist to a concept previously introduced. Rajaniemi has discarded all the unlikely old tropes of space opera — interstellar empires, laser battles in space, ruling nobility — and replaced them with hard-thought extrapolations from our current digital landscape and from cutting-edge physics, biology, exoplanetary sciences, nanotech, and consciousness studies. There exists in his future a wide spectrum of various kinds of minds, from old-fashioned individual intelligences, organic and inorganic, to the hybrid minds found in some citizens of Sirr, to vast collective intelligences of the Sobornost and zoku. Moreover, identity can be split across several incarnations and across multiple platforms and venues, a plethora of realities: virs, spimescapes, et al. And these intelligences do not obey our current political, civic, interpersonal, or economic systems. Entirely new modes of ineracting have been developed and implemented. (Rajaniemi doesn’t neglect cool gadgetry either). Now, this overstuffed approach to SF was first perfected by the sainted A. E. van Vogt, who advocated introducing new concepts and plot twists every 750 words or so. Following in van Vogt’s footsteps, the author Charles Harness famously informed critic Damon Knight that Harness’s novel The Paradox Men was composed by dumping every single idea Harness had over the course of its long composition, however seemingly unrelated, into the same plot bucket. This method of composition is very demanding of the writer and reader both, and can produce wearisome and unintelligible results if not handled with panache. And although Rajaniemi is expert and adroit, admittedly his books do exhibit moments of near incoherence, when one suspects that perhaps even the author did not fully grasp what was going on. But then again, this is no bar to enjoyment, even in mainstream novels. Witness Raymond Chandler’s famous inability to explain all the twists and turns of his own Marlowe mystery to the baffled director trying to film it! Critic and author Samuel Delany famously theorized that the word-by-word parsing of an SF story required a different skill set than that employed by readers of non-fantastic fiction, a suite of narrative-deciphering, navigational tools acquired only after long immersion in the genre. Certainly veteran readers of SF will have a somewhat easier time with Rajaniemi’s books than newbies, but not to as great a degree as possibly anticipated. Because Rajaniemi discards a lot of the usual practices, newbie and veteran face the books almost on an equal footing. Mitigating all of these somewhat scary-sounding prerequisites are the entertaining voices Rajaniemi conjures up, mainly those of Jean and Tawaddud. (In third place comes Mieli, and in fact for the first time we gets lots of her interesting, emotionally deep back-story, explaining her nigh-mythic quest for her lost lover Sydän.) Tawaddud is multi-dimensional, simultaneously Scheherazade, a social outcast, Cinderella, and a healer/mage. Her quest to find her perfect niche in life complements Jean’s search after freedom and selfhood. With his challenging, intellectual high-wire-balancing-act novels, Hannu Rajaniemi is definitely a body thief supreme. From the moment you open the pages of The Fractal Prince, you are overpowered by his swarms of brightly glowing ideas, saturating this freshly minted vision. Previous Previous Post: OED, Murray to "Teledildonics"